It didn't take me long to open the box and try my pasta machine. It was my very first time using a machine to make pasta so I decided to read carefully the notice and to follow my usual ravioli dough recipe (100g of flour, 1egg, a bit of milk which can be replaced by water, a bit of olive oil). To really manage to work it out I had to had some flour, and the kitchen was a real mess, but the tagliatelle were delicious, even if there is room for improvements!!! 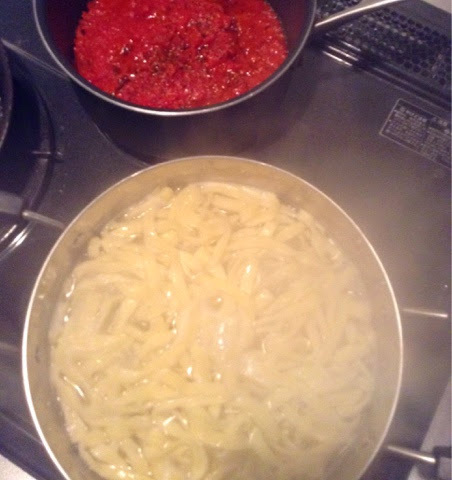 I prepared a simple tomato sauce on the side and served them only with olive oil to enjoy fully their taste and texture.